Now a major motion picture Stephen King’s terrifying, classic #1 New York Times bestseller, “a landmark in American literature” (Chicago Sun-Times)—about seven adults who return to their hometown to confront a nightmare they had first stumbled on as teenagers…an evil without a name: It.Welcome to Derry, Maine. It’s a small city, a place as hauntingly familiar as your own hometown. Only in Derry the haunting is real. They were seven teenagers when they first stumbled upon the horror. Now they are grown-up men and women who have gone out into the big world to gain success and happiness. But the promise they made twenty-eight years ago calls them reunite in the same place where, as teenagers, they battled an evil creature that preyed on the city’s children. Now, children are being murdered again and their repressed memories of that terrifying summer return as they prepare to once again battle the monster lurking in Derry’s sewers. Readers of Stephen King know that Derry, Maine, is a place with a deep, dark hold on the author. It reappears in many of his books, including Bag of Bones, Hearts in Atlantis, and 11/22/63. But it all starts with It. 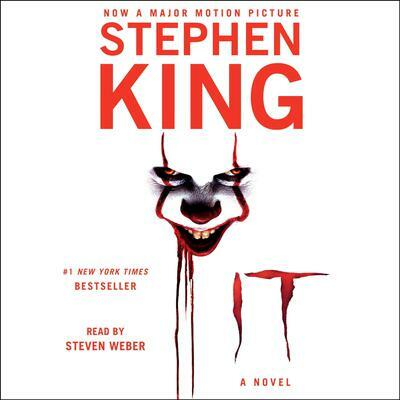 “Stephen King’s most mature work” (St. Petersburg Times), “It will overwhelm you… to be read in a well-lit room only” (Los Angeles Times). Weber's narration makes a magnum opus into a masterpiece. Steven Weber's performance of King's century-spanning frightfest,is a testament to his mastery of voice acting. Performing dozens of characters, from 1950's Irish beat cop Alyosius Nell to the wailing Myra Kaspbrak (and even a surprisingly regal and serene inner monologue by the eponymous creature), Weber brings alive not only discrete eras, but many regions and their unique dialects. As a long-time fan (and repeat reader) of this book, Weber's performance brings out details and nuances that I hadn't noticed on prior readings. He never balks at performing even the most challenging scenes: his delivery pops and sparkles, chills and terrifies. Fans of the book owe it to themselves to give it a listen, and will likely emerge from the other side as fans of Weber's. Couldn't be happier with this version of It. I'm practically floating down here.